Have you heard about Tsum Tsum by Disney? I am a 1970s baby...eheh...still baby? When I think of Disney , character like Donald Duck, Mickey Mouse comes to my mind. Totally 'Old School'. Yeah..I grew up with this character. For those who are the same batch with me can relate to this. While Disney Tsum Tsum only introduced in Japan in year of 2013 as an accessory to Disney Tsum Tsum mobile game. Hurl!!! I was like late 30s moving to 40s. isk isk isk...To be honest, Disney Tsum Tsum is something new to me. I read Tsum Tsum become a hot item and spread out to US and Europe accordingly. Tsum Tsum comes from Japanese word 'Tsumu' which means 'to stack' . Make sense... That is what the toy for. They are my favorite Disney character in form of collectible small item at different sizes and look great if you stacked up. For those who love 'Kawaii' plush toys would love this little one in their room. Recently, the famous Japan Brand Mentholatum launched 'Kawaii' looking packaging beauty care items called Tsum Tsum collection. Isn't they look adorable???? They are not just look super darn cute, but the floral and fruity scents complete this range. Hurlll!!!! you got to love this items inside out. No... No... this is not for kids! 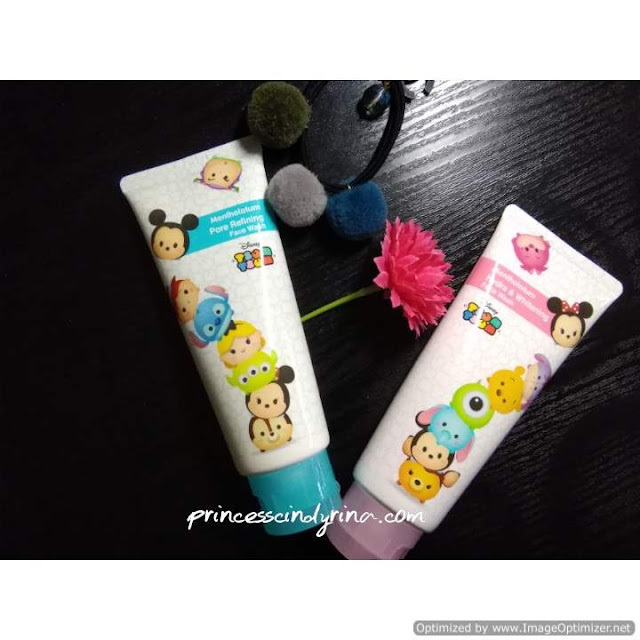 Tsum Tsum Beauty Care collection includes - facial mask, hand lotion, facial cleanser and lip balm. I want this adorable things in my handbag all the time. The Mentholatum Tsum Tsum face mask comes in 4 variants - Lavender , Rose, Tea Tree and Honey. Each of these mask has its own unique ingredients to improve skin conditions. 1. Rose ( Deep Hydrating Face Mask) - Combines 4 types of super moisturizing ingredients and the famous Hyaluronic Acid for 24 hours long lasting hydration to the skin which make it more firm , supple and smooth. It also contains Wild Soy Bean Seed Extract and Natural Yeast extract to help strengthen skin's natural protective barrier. I tried this last week, it really help to smooth away roughness and leave my skin feeling soft and supple. This mask suitable for dehydrated skin. 2. Lavender (Soothing and Hydrating Face Mask) - It contains my favorite calming effect flowers extracts Lavender and Chamomile to calm irritated skin and smoothen rough area and even suitable for sensitive skin. Why? It claimed contains 4 types of Hyaluronic Acid and soothing ingredients to help restore, nourish and strengthen the skin, leaving it refreshed and energized. 3.Honey (Revitalizing Face Mask) - For those of you who are having problem with dull skin can try out this one. This face mask combines Vitamin C, Tranexamic Acid and other brightening ingredients to help deeply hydrate, soothes redness and improve skin tone, leaving skin looking healthy and enhanced with natural radiance. The natural Honey and Yeast extract helps to deeply nourish and moisturize the skin. It improves skin elasticity and minimizes the appearance of fine lines over time to keep the skin looking plump and firm! 4. 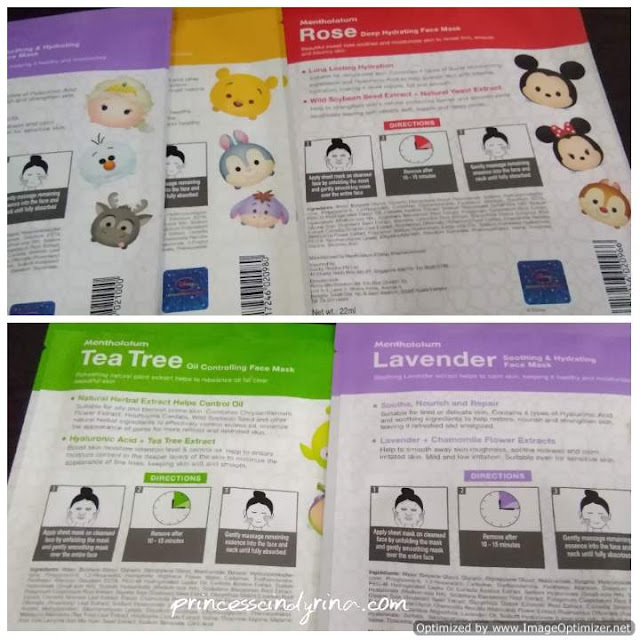 Tea Tree (Oil Controlling Face Mask) - For those who have oily and blemish prone skin can choose Tea Tree Face Mask from Mentholatum Tsum Tsum collection. Not just tea tree oil and Hyaluronic Acid to help boost skin moiture retention level and oil control. It has Chrysanthemum Flower extract , Houttuynia Cordrata, Wild Soybean Seed and other natural ingredients to effectively control excess oil , minimize pores for a mere refined and hydrated skin. Mentholatum Tsum Tsum Face wash created to suit Asian skin in the hot and humid weather like ours, Malaysia. 1. Hydra and Whitening Face Wash - formulated with Arbutin and my favourite Rose extract helps to brighten up and improve skin radiance for more even skin tone. 2.Pore Refining Face Wash - This is my first time using Lentil extract skin care. I only eat 'Pappadom' snack made from Lentil. hehehe.. Apparently , Lentil extract can help to minimize pores and re-balance oil for more refined smooth skin. Formulated with Rosemary and Witch Hazel extracts to helps deep cleanse and purify pored for a healthy clear complexion. The Aloe extract helps to soothes out ad moisturize skin while natural orange scents totally lift up your mood and refreshes the skin at the same time. Mentholatum Tsum Tsum Hand Cream contains ultra moisturizing Almond Oil and Sunflower seed oil as well as other ingredients to help nourish, protect and ensuring more youthful - looking skin. Skin feels hydrated and smooth as you further massage the hand cream into your skin while the great flower scents calms you after long hectic day. Furthermore apart from hydration it helps to strengthen the nails thus preventing them from becoming brittle. This lipbalm contains Vitamin E, Argan Oil, Meadowfoam Seed Oil and other moisturizing ingredients that deeply nourish the lips. I love the ultra-smooth and lightweight texture of this lipbalm. The fruity flavor of Apple, Lime or Peach totally melts on your lips for long lasting moisture - keeping the lips smooth, healthy and protected from harsh environment and extreme weather. Where to get your own Mentholatum Tsum Tsum beauty care collection ? You can visit the nearest Watsons, AEON Wellness , Caring and Sasa nationwide. Some of the famous Brand under Mentholatum : Lipice, Oxy, Hada Labo, Selsun, Sunplay, Rohto C Cube, Deep Heating Rub. First time juga dengar cerita Tsum Tsum ni. Terus I bukak youtube nak tengok cerita dia. Character macam lebih kurang kebanyakan Disney punya cerita. 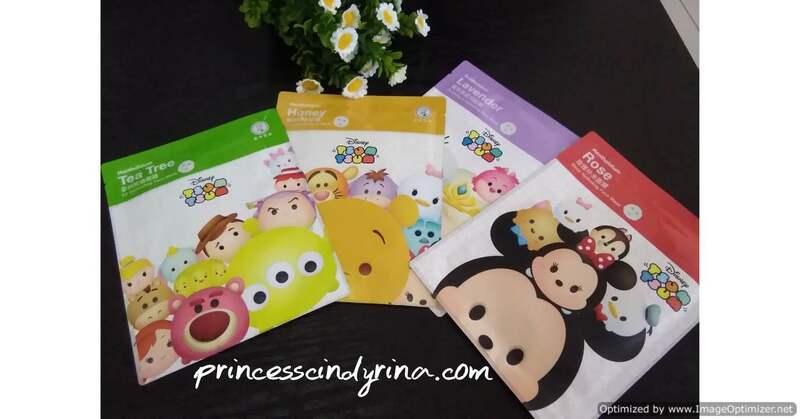 All in Tsum Tsum kan.
Hahaha..first2 tgok packaging dia ingatkan untuk kanak2..kisahnya utk orang dewasa. 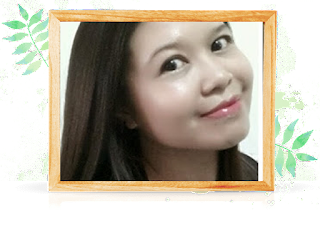 Cute betul..hehehe. Indeed, they look cute !! The name itself shows how cute it is. Sounds like food. Probably because of fasting month. Everything sounds like food. Hahaha. Anyway, for that cute packaging and the benefits its offer, i think that is such a good investment. Very affordable yet effective. Omg love all the collections . Love the cute packaging with cartoon characters . I want to have this collection too . Aiyo ...so cute! I love the packaging - makes nice gifts.